An arts festival, by nature, is a temporary phenomenon—a celebration of the artistic impulse that lasts only a few days, in which a few city blocks are set aside for art on display and in process of being created, then the space returns to its mundane routine afterward. This year, the Utah Arts Festival brings an art form so singular and so temporary that it doesn’t initially come to mind when you think of the wide array of art forms and genres that usually take center stage at a festival: sand sculpture. It’s an art form more reminiscent of childhood play and idle recreation time than making profound statements. And Ted Siebert is no ordinary sand sculptor. Working with The Sand Sculpture Company, which he founded in 1986 in Woodstock, Ill., he’s constructed hundreds of works of sand art all over the world—and as co-captain of the team Totally In Sand, has broken the Guinness orld Record for the longest and tallest sand sculptures numerous times. The team’s tallest clocked in at 24 feet. He is listed in the book The Sculpture Reference as one of the leading contemporary sculptors. His company has produced educational videos and has been featured on television and magazines nationally; Siebert has written several other books, and holds the titles of World, North American, U.S. and Canadian national champion in the field. 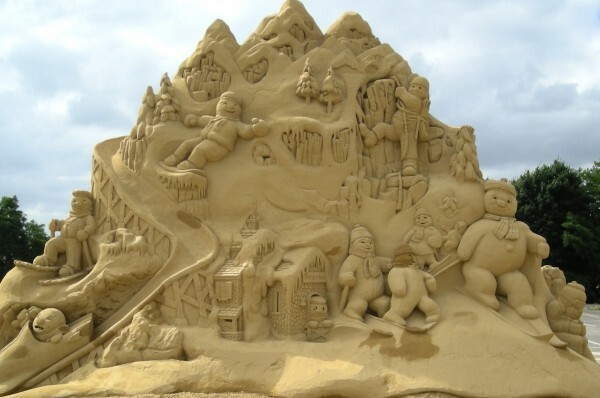 He was featured on the TV reality show Sand Blasters about sand sculpting on the Travel Channel in 2006 and 2007. And it’s not his first time here, either: He erected a sand sculpture for the Utah Arts Festival in 2002. Siebert’s initial foray into the art world was in painting, and after college he worked as a book illustrator. But he had always been interested in sand, and while studying in Seattle, entered the annual sand-sculpture competition at Cannon Beach, Ore. “As a team event, it taught a lot of interpersonal dynamics,” he says. The publisher he worked for hired him to write a book on the subject, and that experience opened up his eyes to the possibilities for the art form. He starts by locating good sand in the locale where the piece will be constructed. In this case, the festival sent him two samples of sand from local companies, and he selected his material from Geneva Rock Products. Then he packs the sand inside wooden boxes with a machine, removes the box top and carves from the top down. He says there’s “no show,” but spectators find his team’s process endlessly entertaining. “People are fascinated watching the process, and I think that’s twofold,” Siebert says. The festival was looking for a chance to ask this unusual artist to return, but had problems with the Library Square site until it was reconfigured in 2011 to make more room for such a demonstration, which will be on the north end of 200 East, near 400 South (the site of glassblowing demonstrations in 2011). The City Parks Department will help dispose of the sand for use at its golf courses and other similar sites, and thus the material is recycled and given further life. Siebert still sculpts in wood and clay and uses oil paints, but his sense of craftsmanship is no less in this transient medium. It’s part sport, part childlike pastime and part art form as demanding in technique as any—and as worthy of admiration and acclaim—when you put the amount of detail into it that he does. “The temporary nature of our work seems so odd for some people, but it is the sense of accomplishment you get when you build something with your own hands and out of something that clearly doesn’t want to stick together in its natural state,” he says.